When you think about insurance, one word comes to mind: DISRUPTION. In auto insurance, usage based insurance is making waves. In homeowners insurance, connected homes present new insurance challenges. In health insurance, cost control and wearable health tracking devices are keeping things interesting. And, in business insurance, emerging exposures are endless – from marijuana legalization to drones and cyberattacks. Insurance customers are changing too. With the millennial generation growing in force, there seems to be less emphasis on price shopping and greater appreciation for company values, conveniences, mobile access and not to be overlooked … self-empowered decisions. Now, what does all this mean for insurance marketing? In one word: CONTENT. Insurers can no longer rely on feet-on-the-street and person-to-person selling. They can no longer buy customers with low rates. These tactics are not cost effective or sustainable, and more importantly, insurance customers don’t want them. What do customers want? They want to be treated like smart, sophisticated buyers who can think for themselves. In a nutshell, they want quality information at their fingertips – without the sales pitch. 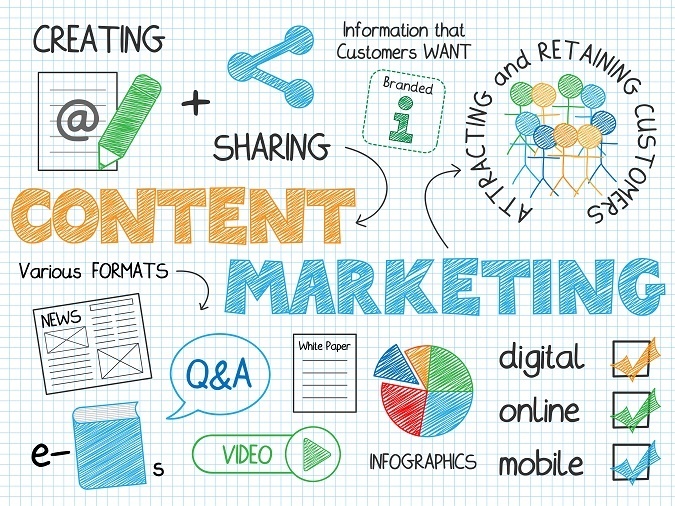 Adweek reports that content marketing is the most commercially important digital trend for 2015, based on a recent study from Smart Insights. SocialMediaToday reports that content marketing is essential for ranking under Google’s algorithms. It gets better. Content marketing also bolsters your brand, drives social engagement, attracts incoming links and establishes your company as a thought leader. HubSpot has found that marketers who prioritize blogging are 13 times more likely to have a positive ROI. KissMetrics says that content marketing and SEO go together like peanut butter and jelly. How can you argue with that? While insurance has gotten a bad rap for sometimes lagging behind the marketing eight ball, we can all agree that insurance is not immune to these marketing trends … especially now in the age of insurance disruption. While everything in the insurance industry is changing, one thing will always remain constant: Communication is essential, and when it comes to communication, content is king. Now, I know what you may be thinking: What’s the difference between content marketing and inbound marketing? Good question! While the two are quite similar, one HubSpot article explained that content marketing is the lifeblood of inbound marketing. Think of it as the fuel or the oxygen that keeps the inbound process of attracting and converting going. While content marketing is simply the creation and delivery of great content, inbound marketing also includes broader elements such as the website platform and the conversion architecture. You might also be wondering … What types of content should your company have in its marketing arsenal? Eyes and ears: Content marketing requires input and collaboration from all members of your team. They don’t have to write the content, but they do need to keep you informed about what customers care about. What are your customers’ headaches, challenges and frustrations? At what point in the prospect journey do they typically jump ship and why? Are there aspects of your product or service that are confusing? Why do customers leave? Are there success stories that can be shared? You have a lot to talk about if you get the right people talking. Topics and dates: Preplan your topics and dates in a flexible editorial calendar. Assign different topics their associated departments to secure their input and collaboration in a timely, targeted basis. If all your work comp renewals happen on January 1, arrange your work comp content strategically leading up to that date. Don’t roll out empowering information on January 2, after the decisions have been made. Writers and designers: Whether you do this in-house or outsource, you need a team of pros to carry out your mission. We recommend a blend of in-house and outsourced effort. For example, try to produce one blog article in-house every week and outsource one blog topic every week. By sharing the load, your efforts won’t be completely derailed if the in-house person is sick or has a last-minute fire to put out. Consistent execution is key. Content promoters: Your content has to do more than just live on your website. It needs to be actively promoted. If you don’t have an in-house social media coordinator, consider outsourcing. Also, engage your entire team in sharing content through their own social channels. The more the merrier! Want to know the best part? NOW is the ideal time. Inbound Insurance Marketing is here to help. Consider us your premier source for original, quality content writing. Contact us if you’d like to learn more. Also, don’t forget to subscribe to our blog below!